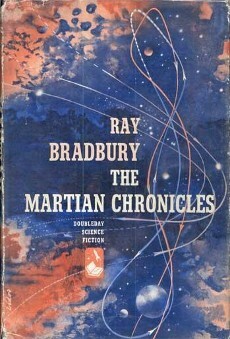 The Martian Chronicles - Chapters Twenty four to End of Book - Jimmie Aaron Kepler, Ed.D. Chapter Twenty four – The Watchers (November 2005/2036) first appeared in The Martian Chronicles. The colonists witness a nuclear war on Earth, from Mars. They immediately return out of concern for their friends and families. Chapter Twenty five – The Silent Towns (December 2005/2036) first published in Charm, March 1949. Everybody has left Mars to go to Earth, except Walter Gripp — a single miner who lives in the mountains and does not hear of the departure. At first excited by his find of an empty town, he enjoys himself with money, food, clothes, and movies. He soon realizes he misses human companionship. One night he hears a telephone ringing in someone’s home, and suddenly realizes that someone else is alive on Mars. Missing the call, and several others, he sits down with a phone book of Mars and starts dialing at A. Their meeting is the opposite of what he had hoped for in his dreams — he finds her thoroughly unattractive (due to her weight and pallor), foolish and insipid. After a sullen day, she slyly proposes marriage to him at dinner, as they believe they are the last man and the last woman on Mars. Gripp decides to run, driving across Mars to another tiny town to spend his life alone, ceasing all contact with Genevieve. Chapter Twenty six – The Long Years (April 2026/2057) first published as “Dwellers in Silence” in Maclean’s, September 15, 1948. Hathaway (the doctor from the Fourth Expedition) is living retired on Mars with his family, even though everyone else has departed. Hathaway is a mechanical tinkerer, who has wired an old town below their house to sound alive at night with noise and phone calls. One night, he sees a rocket in orbit, and sets fire to the old town to signal the rocket. Captain Wilder (also from the earlier stories about the Fourth Expedition) finally returns to Mars after twenty years exploring the outer solar system. They land and have a reunion with Hathaway, who is troubled by his heart. Undeterred, Hathaway brings the crew to his house for breakfast. Wilder remarks that Hathaway’s wife looks exactly as she did many years ago, as he knows her real age and knew her in the past. One of Wilder’s crew pales when he sees Hathaway’s children, knowing that the son should be the same age as he. Wilder sends the crewmember off to check some headstones that he saw when they landed. He returns, and says that the adults now before them are buried. Wilder offers Hathaway a rescue back to Earth, but Hathaway’s heart fails and he dies, begging Wilder not to call his family because they “would not understand.” Wilder then confirms that Hathaway’s wife and adult children are androids. As Wilder prepares to depart, one of the crew returns to the house with a pistol, but shortly after returns, having been unable to bring himself to kill the robotic family even knowing that they were not truly human. The rocket departs, and the android family continues on with its meaningless daily life. Chapter Twenty seven – There Will Come Soft Rains (August 4, 2026/2057) first published in Collier’s, May 6, 1950. The story concerns a household in Allendale, California, after the nuclear war has wiped out the population. Though the family is dead, the automated house that had taken care of the family still functions. The reader learns a great deal about what the family was like from how the robots continue on in their functions. Breakfast is automatically made, clothes are laid out, voice reminders of daily activities are called out, but no one is there. Robotic mice vacuum the home and tidy up. As the day progresses, the rain quits, and the house prepares lunch and opens like a flower to the warm weather. Outside, a vivid image is given: the family’s silhouettes were permanently burned onto the side of the house (as occurred at Hiroshima) when they were vaporized by the nuclear explosion. That night, a storm crashes a tree into the home, starting a fire that the house cannot combat, as the municipal water supply has dried up and failed. The title of the story comes from a poem, randomly selected by the house to read at bedtime, also titled “There Will Come Soft Rains”. The theme of the poem is that nature will survive after humanity is gone, reflecting the theme of the story; that even the vast cities of humanity will eventually be reclaimed by nature. In the original story in Collier’s, the story took place 35 years into the future, on April 28, 1985. Chapter Twenty eight – The Million-Year Picnic (October 2026/2057) first published in Planet Stories, Summer 1946. A family saves a rocket that the government would have used in the nuclear war and leaves Earth on a “fishing trip” to Mars. The family picks a city to live in and call home. They go in and Dad burns tax documents and other government papers on a camp fire, explaining that he is burning a way of life that was wrong. The final thing to go on the fire is a map of the Earth. Later, he offers his sons a “gift” in the form of their new world. He introduces them to Martians: their own reflections in a canal.